to cut a few flowers to bring inside. and make our dearest friends, who were joining us for Easter breakfast, smile. To be able to go outside and pick flowers that she planted, tended and loved. What an absolutely splendid life. To wonder when the last of the daffodils will open and finally disappear! Or, to look up and see dogwoods against a rich blue sky. 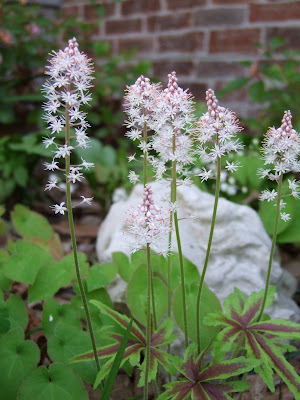 The Tiarella flowers were like little stars exploding on the end of a fairy wand. nestled up next to the Phacelia bipinnatifida. Shooting Stars (Dodecatheon meadia) happily growing in the clay soil! Wasn't I lucky to love those plants! This garden is home to me. At times, I wanted something easier, something grander, something different! I really am so very fortunate! Thank you for taking the time to visit with me~~I wish you all a good week and hope that your days are filled with the sweetness of springtime. Beautiful blooms Gail! Love the dog sculpture in the Mayapples. Spring is certainly time for celebration of life renewed. I think any one who gardens is fortunate. When I meet people who don't garden I wonder what they fill their lives with. Yes you are very fortunate. Gardening sure makes us realize this and what a great feeling. Your gardens are so lovely and I don't know why you'd ever have any doubts! Ooooh--- there's a hummingbird sipping nectar from the lantana in our planters right now! She just went to the scabiosa -- wow! Now, back to your garden. I'd love it if you would tell us more about the Camassia. That has been on my list for years, but I still haven't "gotten to it" -- oh, the hummer just went to the window feeder! Got to get my camera set up on the tripod! :-) Sorry for the interruption! Beautiful pictures Gail! That dog sculpture with the mayapple ears is great! Great planning! What kind of tiarella is that? I really like the leaves on it. Wishing you a good week as well, full of as many blessings as there are flowers in your garden! Such loveliness surrounds you. I feel your feelings of gratitude and the love you have for your life. My gardens do that to me also. I'd love to read the rest of the story so will look in your archives and enjoy I'm sure. Thank you for sharing the beautiful pictures and your sentiments. Your post really shows how connected one is with the garden, and how emotional one is about it! In spring, unfortunately, I'm always a bit down due to animal damage, both of flowers and digging under my deck. In fact, I have to admit that in the last two years, the garden hasn't been all positive to me but kind of gets me down. I hate seeing things destroyed. But at least the winter-sown seedlings are coming up! Those are lovely thoughts, Gail. Sometimes I have moments of insight like yours. I treasure those times. I hope you had a happy Easter, Gail. There's a quote that I can't remember now about appreciating what we have rather than always wanting more. Gardening reminds me of that...finding joy in all the beauty surrounding me rather than looking for it some place else. You have so many beautiful blooms already, Gail; the "Queen of the Night" is gorgeous, much prettier than what I've seen in plant catalogs. Your brunch table must have looked lovely! You have some real beauties gracing your garden, and their loving care is obvious. Thanks for sharing these beautiful photos and your love of life with us. What a beautiful post Gail! It's good to know that you appreciate your garden and the joy that goes with creating and tending a garden. I think that's what makes a gardener a 'proper' gardener - being able to feel the happiness. Monica, I am sorry to read that your groundhog has taken the joy out of your springtime...or is it another critter! It's good that the winter sown seedlings are popping up. Now what can we do about those critters! Sometimes we make our own luck, and that's what you've done. How beautiful are all your spring flowers. My Shooting Stars have sprouted, and my Trilliums are just poking their noses out of the soil. I wish I could smell this post, I can only imagine the wonderful scent of the Lilacs & Hyacinths. grateful is a really good place to be. being content with what we have and are surrounded with is a rare gift these days. i am so glad you have made peace with where you are and your garden...i am getting to that place...i haven't always been happy to be here but as i spend time, energy and plant what i love i am beginning to really feel at home. i hope you had a wonderful easter with your friends for breakfast. happy springtime days. There are so many flowers in bloom in your garden now. I love the little 3 petalled blooms of the Trillium. They are a beautiful flower, but I'm not sure if the ones I planted last year ever took hold. Your white Dodecatheon meadii are so delicate looking. I love this woodland plant. I have some pink coloured ones, but they never recovered well from the beating they took when my fence was replaced. This is a great time of year for the woodland types flowers. Lots of beauties! I love the tulip. 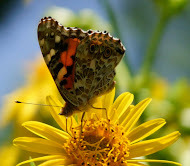 I have that one and hope to see it this spring for the first time! You certainly are blessed with your property and the realization that you are so fortunate. I can't wait until my garden is at the same blooming point that you are now experiencing. It si such fun to go out and find something new blooming every day. Happy happy. I love all the purples. They are so pretty and cheerful. I have to think that people who don't garden are missing a lot in life. Gail your spring flower collection is magnificent. I love your trilliums! Well, everything really. :) I agree with Les that anyone who gardens is fortunate. Gardening is a source of real joy. What a beautiful post. It made me feel so good to read it. Hi Gail, Sorry if I sounded grumpy earlier, I was just having a Monday-morning moment! Yes, it is primarily the groundhog... but I've had trouble with raccoons lately, too. I'm trying to stay positive, though. I just spread 6 yardwaste bags full of pine straw (which is not sold here, but my mom raked it all up) on my beds and feel a little better! I do have hyacinths and some chionodoxa that I didn't plant (?!) for some color. What a beautiful post today! I think when others get to witness another persons gratitude, it almost becomes a mirror to look at our lives and what we have to be grateful for. Thank you! All of your flowers are beautiful! My garden, young as it is, also fills me with gratitude for beauty to enjoy myself and share with others. Those thankful feelings must be part of why gardeners are happy, generous people. 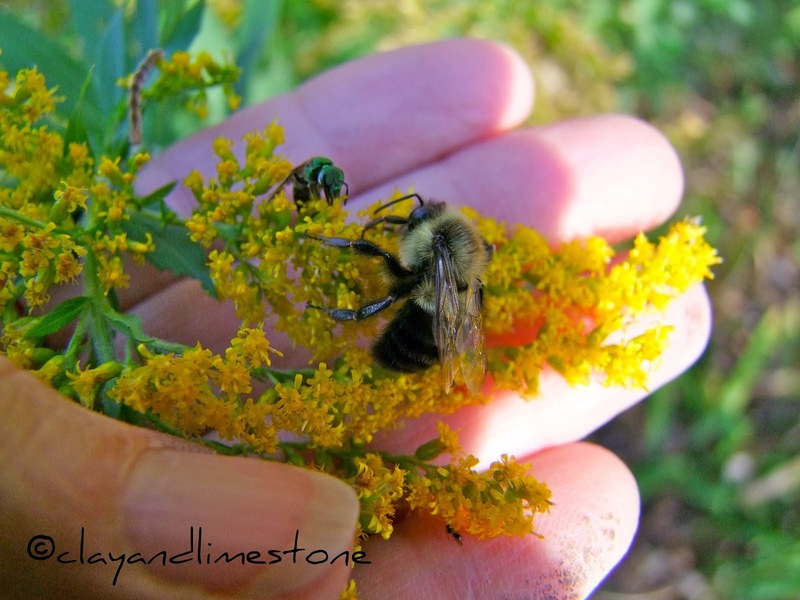 We are all so fortunate to have found our connection to nature & wildlife through gardening. I can't wait till more purples and pinks arrive in my garden. We are still waiting for the trees to bud and the tulips to pop! LOVE YOUR BLOG!!!! THANK YOU for making my day brighter. What a lovely post, Gail. Your blooms are all gorgeous! We all need to take the time to be thankful for what we have. It is so much more than we realize. How really fortunate your are to have such fragrant and lively beauties! Irises! What more can one ask for? Hi Gail, So many beautiful plants! I'm not familiar with (meaning I've never heard of) Tiarella. The foliage is fantastic and the flowers are so dreamy. Simple elegant flowers like trillium are always so inspiring to me. I suppose some things are just naturally perfect. Have a beautiful week! When you wrote the earlier Chez Cedar post, Gail, I read it but never got around to commenting how cool it was to see someone reach a contented and balanced relationship with her garden surroundings. This post adds another layer to the tale and the beautiful photos illustrate it well! It sure is a very busy time in the garden - just time to pop around and wish the gardenblog world a Happy Spring. 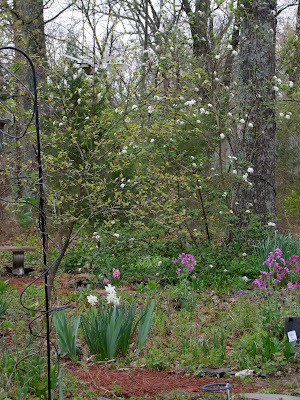 You are indeed blessed to be surrounded by such beauty, Gail ... your garden is stunning! You are lucky indeed to be the nurturer of such lovely gardens, Gail. I hope you had a lovely weekend! Wow! Your gardens are absolutely amazing! And beautiful pictures too! I hope I can one day get my home's gardens to look as good as yours! I love the little Tiarella flowers, they are just so special.....are they a bulb?? My Trillium is still not flowering, it didn't last year....huge leaves though.....strange!!! And we are so very fortunate that you share the beauty of your garden with us! I'm sighing with envy and appreciation. I think everything looks and smells better when my heart is full of gratitude and happiness. Good friends, family & flowers - it doesn't get much better. We are the fortunate ones. We get to be your friends. The lovely flowers are more lovely when they have admirers. I'm an admirer. I love coming to Clay and Limestone. So fortunate--and blessed to know how special it is to be in tune with nature. I understand what you mean about coming full circle with the garden--wishing for what your garden is NOT, and finally accepting it for what it is and seeing it's potential. Thank you for showing us your Easter blooms. gail, wow, that Queen of the night knocked me – I opened your blog and it just hit me. What a gorgeous flower, and an equally gorgeous picture! Can't make up my mind if I'd prefer the flower in my garden, or your picture on my wall! Beautiful bouquet of spring flowers you've shared with us today, Dear Gail. You are indeed home in your garden and I'm so fortunate to get to come along on this journey with you. You have again captured the essence of feelings gardeners have when we realize how very blessed we are. Happy, happy Easter and spring to you. Gorgeous gorgeous Gail! Such a variety already ...I've arrived home and it's late so I am anxious to walk my garden and see what's waiting! Happiness is our gardens in Spring! It's a blessing to be grateful for what we have -- and you certainly have a lovely garden. You're fortunate, to be sure, Gail, but so are we; that we get to share your garden with you, and that we in turn revisit our own plantings with eyes wide open and hearts filled with joy. Such a lovely post, as always.